We are officially at a loss. My wife and I have a 8 year old male and a 9 year old female boxer. The female is not the issue. She seems to have no problems besides she is deaf. Our male on the other hand has had this skin issue going on 5 years now. Recently it has gotten much worse and he smells like death. Here is kind of the timeline and progression. Lived in northwest Florida and he showed minor signs of allergies such as redness in feet with some biting and licking. Changed his diet to Premium Edge Adult Dog Skin & Coat Salmon, Potatoes & Vegetables. This seem to stay the problem but did not make it better. Seen by vet a couple times and they just told us it was diet or environment. We moved to Italy in 2009 and had to find a different food due to availability of the Premium Edge. 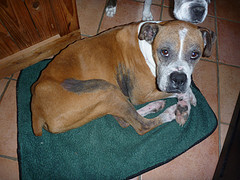 We changed his diet again to Royal Canin Maxi Boxer. He seemed to take to this food very well. Within 3 months of the diet change he started to develop some blackening skin in the armpits and groin area. Took him to the vet and they did skin scrapings and blood work. Scrapings came back clean but the said he had a minor infection...mostly in his ears. They gave us antibiotics and drops/wash for his ears. Ears cleared up after 10 days of treatment and are still good. Blood work came back with thyroid dangerously low. He was not overweight(60 lbs). They put him on Thyroxine(0.7/day) and told us to come back in 12 weeks. Thyroid meds were still a little bit low so they doubled his dose (0.7 twice/day). After another 6 weeks he had lost 7 pounds. They did blood again and this time it was within limits but they wanted to bring it down a little since he was losing weight. Dose now at 0.5 twice/day. We thought a few months ago that it may be the Royal Canin causing the issue, so we changed back to the Premium Edge Adult Dog Skin & Coat Salmon, Potatoes & Vegetables because we found a company that would ship it to Italy. We were recently prescribed Atoplus (italian version of Cyclosporin), BUT have not started this treatment yet. We really would like to find the root cause before frying his immune system with a non-specific drug. I am very sorry for such a long post but I wanted to included as much info as possible. Thank you in advance for any ideas/suggestions. Thanks for your detailed description of Zenos' problem. I hope you don't mind that I have included some of your photos on this page. 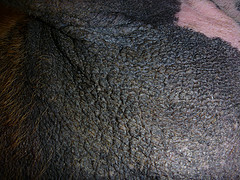 Black, thickened skin like this tells us that there is a chronic process going on. One of the first things that we think of when we see skin like this is hypothyroidism, so this can definitely be a contributing factor for him. If you are noticing a bad smell, there is a really high chance that he has some infection. This could be either bacterial infection or yeast infection. If I had to guess, I would put my money on Zenos having a yeast infection in these areas. It's possible that this all started because of hypothyroidism and allergies. Then, the inflamed skin became infected. 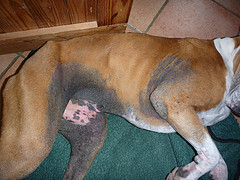 Do you know if your vet has done a cytology of the affected skin? One way to do this is something called a "scotch tape test". This is where we take scotch tape and press it against the stinky part of the skin and then put the tape on a microscope slide, stain it and look at it under the microscope. If there are yeast cells present then we have our answer. They may also see bacteria there. If the vet is seeing yeast then they may need to use an oral antifungal for several weeks. These drugs can be expensive, but unfortunately a cream would not work well. If this is a bacterial infection then it will likely need a long course of antibiotics in order to go away. It wouldn't surprise me if he needs to be on 8 weeks of an oral antibiotic to clear this up. If all of this doesn't get us an answer, then my next step would be to biopsy this skin. This would be to look for strange conditions that could cause this. 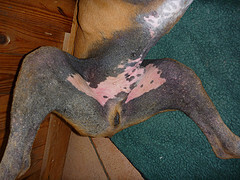 I've seen boxers get black skin like this because of "seasonal flank alopecia". However, these dogs usually only have black skin on the sides of their bodies. And they are not itchy or stinky. Similarly, there is a condition called acanthosis nigricans which can cause skin to turn black and be prone to infections. However, as far as I know it has only been seen in daschunds so far. I really think that there is some type of infection though. Thank you so much for your thorough reply. One other symptom he has that I did not list is that he shakes...like a chihuahua. He lays down and curls his feet up by his chest and twitches. Do you think this is from pain? You seem to be leaning more toward his thyroid and infection than allergies. Do you think that it would be worth doing an allergies panel for approx $300 before we get the skin to clear up? Or, let the antibiotics/anti-fungal do its magic before tracking down the allergy? I'm not sure why he's shaking. It could be because of pain or discomfort. He's probably very uncomfortable with this skin problem. While allergies are a possible underlying cause to the skin problems his primary concern right now is dealing with any infection that's there. Once we get that dealt with then I would go after the allergies.